“Moving is easy and packing is fun”, said no one ever! This is the year that you decide, "it's time to move!" But you look around at everything you own, and the very thought of having to pack it all up and move is overwhelming. I don't know about you, but when I have a large project to tackle and if I don't break it down into manageable steps -- I'm definitely overwhelmed. Moving can be stress free and efficient by following a few easy tips that will make your move more streamlined. Go through one room at a time. Sort through your closets, drawers, cupboards, attic, basement and garage. As you go through each room, sort your belongings into 3 sections. The first section is for belongings that you're going to keep and bring with you on your move. Second section is for items that you'll donate. And the third are what you'll be selling at a garage or estate sale. Rule of thumb here is if you haven't used an item in over 6 months to a year, it's time to let it go. Think of it this way, the more you get rid of, the less you have to pack, move, and organize in your new home. Sort through paperwork. Put any appliance manuals you have in a kitchen drawer for the new homeowner. Keep legal documents and important papers to transport with you. All other paperwork that is older than 7 years can be shredded. This is also a great time to take an inventory of everything you own that is of value. Determine the replacement costs for insurance purposes. Boxes from your grocery store may work well and doesn’t cost you anything. However, they may not be clean or hold the weight of your items. Consider used boxes. U-haul has a great program called; take a box, leave a box. It's where customers can drop off their moving boxes for other customers to take and use for free. A great way to help each other reduce moving costs. Keep items clean by using packing paper, rather than newspaper. This alone will same you time when you unpack. Get plenty of packing tape and markers. You will probably need more than you think you do. You'll also need bubble wrap, scissors, and labels. Pack non-essential or off-season items weeks before your move. Books, knick-knacks, framed art and anything else you won’t use until you are in your new home can all be packed early. Designate an area in the garage to keep packed boxes till moving day. Packing tip: pack heavier items in smaller boxes, and lighter items in larger boxes. This will help prevent making any box too heavy, and will help prevent someone from dropping it accidentally. Don’t pack all your tools. You might need a screwdriver for taking the mirror off the dresser and other possible last minute projects. You’ll need them at your new home too, along with light bulbs, extension cords and power strips. Make a “just in case” checklist and keep those items handy. Unpacking is harder than packing because you have to decide where everything goes in your new home. Give yourself a break by labeling boxes clearly with their contents and destination. For example, “Kitchen: Dishes and Glasses” or “Master Bedroom: Shoes and Purses.” Label the tops and sides of the boxes and be sure to mark “Fragile” when appropriate. Make a checklist of everyone you need to notify about your move. Get change of address forms at the post office. Call your Family & Friends. Contact your Doctor's office for any medical records you may need. If you are transferring your child(ren) from one school to another, have school records sent to the new school. Give your bank, creditors, and any other companies that you deal with your new address. You might choose to move heirlooms or precious breakables in your own car. Keep your hanging clothes on the hangers. Wrap them in plastic (large garbage bags work well), and lay them in the back of your car. This will save you a lot of time when all you have to do is hang your clothes back up in your new home. Everyone in your family needs pajamas, clean underwear, a change of clothes, and basic toiletries. Snacks and medications should be handy, as well as a small first aid kit. You might want to pack these in a clear plastic box so they stay in plain sight. Some things you will need immediately at the new house include; toilet paper, hand soap, bed linens, cleaning supplies and anything else you will want for your first night at the new house. You will probably be too tired to unpack everything, so keep the overnight bag and essentials in your car until you need it. Make the beds, go out to eat and get a good night’s sleep before tackling the unpacking in the morning. You've made it! Moving day is here. 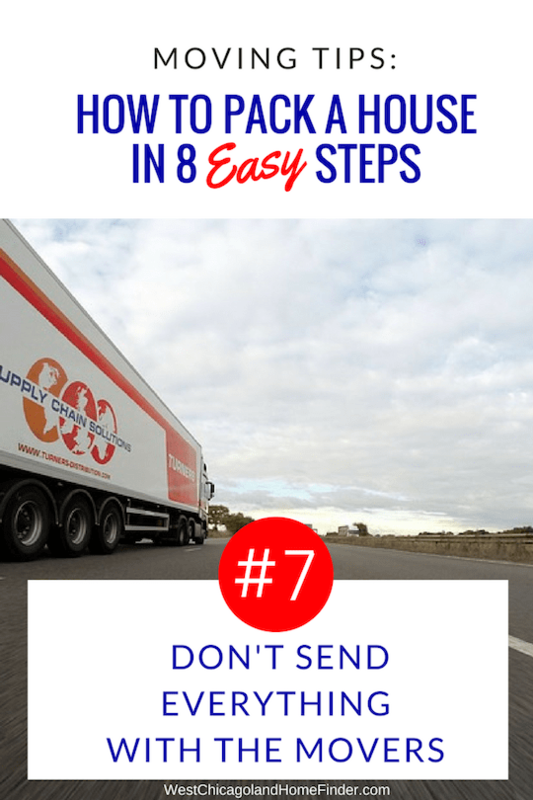 I hope that these tips have made your move more streamlined and efficient. One last thing to do after the movers have finished. Take a final walk through, lock windows, turn off lights, close doors, make sure nothing was left behind. This Real Estate article "Moving Tips: How to Pack a House in 8 Easy Steps" was written by: Maria Mastrolonardo. Maria is a Realtor with RE/MAX of Naperville. She's been selling Homes in the West Chicagoland suburbs including but not limited to; Naperville, Wheaton, Lisle, Downers Grove, Aurora, and Winfield for 20+ years. Need help buying or selling a home? Call or Text Maria at (630) 248-6077 or email her at mmastrolonardo@gmail.com.